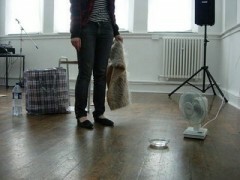 Live Art Falmouth: 2. Do animals understand art? If one strand of work in the festival took its focus to be human interaction, then another wholeheartedly embraced the non-human. 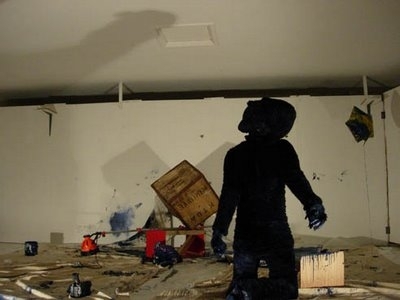 This was sometimes comical, as with Kayleigh O’Keefe’s melancholy attempt to become a shark or Bill Leslie’s riotous vision of an ape trying to make it in the world of art school, struggling with the padded fingers and obstructed visibility of his costume to open paint cans, position lights, hang and paint a canvas, and document himself with a video camera. With her series ‘Steps Toward Becoming Animal’, Dani d’Emilia takes a more serious, visceral approach. In the video piece ‘Meat My Mirrors’, parts of the artist’s body combined with ground meat and tubes of milk are rendered unrecognisable by mirror images doubling and quadrupling. The resulting images undulate with a strangely beautiful yearning, perhaps the desire to offer sustenance within an endless cycle of regurgitation. One of the most revelatory pieces of the festival was Michael Fortune’s film piece ‘Reigning Cats and Dogs’ (despite its rather uninspired title), which looks through different eyes at what feels like a completely different world. Using long, fixed frame camera shots, with the camera usually placed at floor level, we see various vignettes in a manic household which a large family shares with an uncountable number of cats and dogs. A room full of cats waits tensely outside a closed door, their changes in attention signalled by countless twitches of ears and movements of heads. Three dogs jump over and over again, inexhaustibly, at a door handle, until finally a visitor is let in. Four cats eat, all attention on the task at hand, while a dog watches them from the doorway, barking. A dog runs maniacally through a landscape of twinkling Christmas lights, finally knocking over the camera itself. It’s the ambient human life in each shot – people moving about, watching TV, going to the loo – that makes it extraordinary. In the midst of an art festival’s obsessive examination of the human condition (and what could be more symptomatic of humanness than art itself? ), Fortune’s film is a refreshing look from the outside. By removing the human dimension from the work, another, almost autonomous, logic starts to emerge. 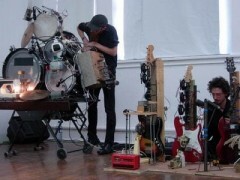 This is the case with Stephen Cornford and Matthew Appleby’s ‘Human Separation’, in which the artists create an ensemble of patchwork machines, one driving a bow across a modified ‘cello, another beating percussively at the frets of an electric guitar. Once each machine has been put in its place and the instrument plugged in, the two humans step away, leaving the noise to build across automated circuits of amplification and feedback. An audience coming in at this point would be treated to the logic, the operating principles, and the functional instruments of music – just without any musicians. 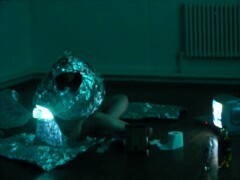 The idea of a mechanism running away with itself seems also to emerge in Emma Bennett’s ‘Glistening, dog, daylight (1987)’, a performance which consists mostly of spoken text interrupted by a few simple actions. Bennett introduces the event, saying, ‘I’m going to do a thing. I’ve not decided if it’s a thing about a dog, or a thing about saying “dog”.’ What unfolds is a hypnotic linguistic cut-up which centres around a few key images: a dog running across a field, a river, the passage of time. As Bennett speaks, language seems to get away from its human, social function and take on a restless, circulating energy of its own – such that, after a while, it doesn’t seem as if Bennett is speaking, or as if there is a subject at all.